Habit: Plant +- scapose, brown, tan, +- pink, +- red, +- purple, (+- green); rhizome branches many, short, scaly, together coral-like. Leaf: at flower 0. Inflorescence: raceme; flower bract << flower, often scale-like. Flower: sepals +- alike, oblong to (ob)lanceolate, generally curved over column and lip, generally 3-veined, lower generally fused at base, mentum present or not; lateral petals spreading or curved toward lip, lip not spurred, entire to 3-lobed, spreading to reflexed; column generally convex adaxially, concave abaxially, curved over lip. Fruit: pendent. Habit: Plant 17--55 cm. Stem: red to yellow-brown to yellow. 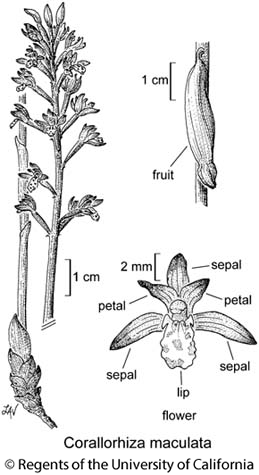 Flower: sepals 5.5--10 mm, lower spreading, color generally same as stems, mentum < 2.5 mm; lateral petals generally like sepals, yellow-brown or deep pink to red, dark-spotted or not, lip 5--7 mm, with 2 rounded lobes laterally, white, unspotted or generally red- to purple-spotted, tip crenate or toothed; column 3--5 mm, +- yellow, purple-spotted. Fruit: 15--20 mm. Chromosomes: 2n=42. Note: Where together, Corallorhiza maculata var. occidentalis typically flowers 2--4 weeks earlier than Corallorhiza maculata var. maculata. Citation for this treatment: Ronald A. Coleman, Dieter H. Wilken & William F. Jennings 2012, Corallorhiza maculata, in Jepson Flora Project (eds.) Jepson eFlora, http://ucjeps.berkeley.edu/eflora/eflora_display.php?tid=20259, accessed on April 23, 2019.